If you’re looking for a new area rug, you probably already have a vision of what you want for color, size and maybe texture. However, those three characteristics should be secondary to others, especially for area rugs that will anchor a high traffic area. Think of your area rug as floor art. You don’t want your art to get dingy and worn, especially if you’re spending a fair amount of money on it. In high traffic areas, a flat weave that is easy to clean will be easy to maintain. On the other hand, in rooms that are largely used for formal parties, you may enjoy a more unique rug with less use, wear and tear may not be as important. How long do you want to keep your rug? Will your area rug be placed in a high traffic area? Will there be potential for dropping food or drinks on the rug? Do you have children, and what ages are they? If you have pets, are they well trained and do they shed? The fibers in your rug will react differently to wear, stains and cleaning depending on the materials that make up the fibers. Wool Area Rugs – Wool is one of the most expensive and luxurious fibers used in area rugs today, and it has its advantages and disadvantages over synthetic fibers. Wool area rugs will wear down in high traffic areas. Vacuum regularly avoiding the binding. Avoid scrubbing spots as the wool may shrink or break down. Jute or Natural Fiber Area Rugs – These rugs are becoming increasingly popular with the consumer trend to use more natural materials, and are made of dried plant fibers similar to hemp. Jute rugs are typically thicker and softer than rugs made from some other materials. They typically require just vacuuming with a hard floor attachment, and should not be steam cleaned, or have rug or spot cleaners used on them. Keep these rugs out of areas like bathrooms that are damp. Jute rugs will also hold onto stains and odors, which is good to know if you are a pet owner. Sisal Area Rugs – Sisal is made from agave plant, and is a great natural material that tends to be stiff and very durable. These rugs will have a lower pile, making them a great base for layering other, more colorful rugs on top. Regular vacuuming of sisal area rugs will keep it looking clean and fresh, as dirt will not cling to the hard fibers. Never steam or shampoo, as the natural fibers will break down and may mold when left too wet. Remove dry dirt with a dull knife or nail file and vacuum up, or liquid spills with a cloth dampened with water or club soda. Synthetic Area Rugs – Otherwise known as Polypropylene rugs made of polyester and acrylic, these rugs will be cheaper but also will not stand up to the test of time like other materials. These rugs tend to be harder to clean, because they hang on to dirt and grime, and they yellow and wear faster than rugs made of natural fibers. They are typically more colorful than natural fiber rugs, and if you like to change up the look of a rook regularly, this might be a good option. Area rugs can range from several hundred dollars to hundreds of thousands of dollars, and the cost is dependent on what they are made of and how they are made. Hand Knotted Area Rugs are made in the same way they were thousands of years ago, and they can take more than one year of hand knotting by artist to complete. These will be among the most expensive area rugs, but will stand up to the test of time. They are also made of materials that will last for decades or more. These are the finest rugs you can find and will be more expensive. Tufted Area Rugs are most often made of wool. These rugs are made using a special tool “gun” that pushes the fiber through the backing and produces a pattern on the front side. These will come in a variety of colors and the quality will vary. Machine Made Area Rugs will be quickly manufactured and fashion forward. They are an exceptional value for the price and are typically made of synthetic fibers. They will not last through generations, but can be beautiful and reflect the latest color trends. 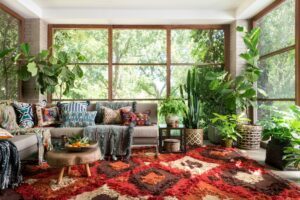 If you’re looking for a quality area rug and need help selecting the right rug for your space, the rug experts and interior designers at Dwell Home Furnishings & Interior Design can help. Come to our Coralville location and check out the great selection.